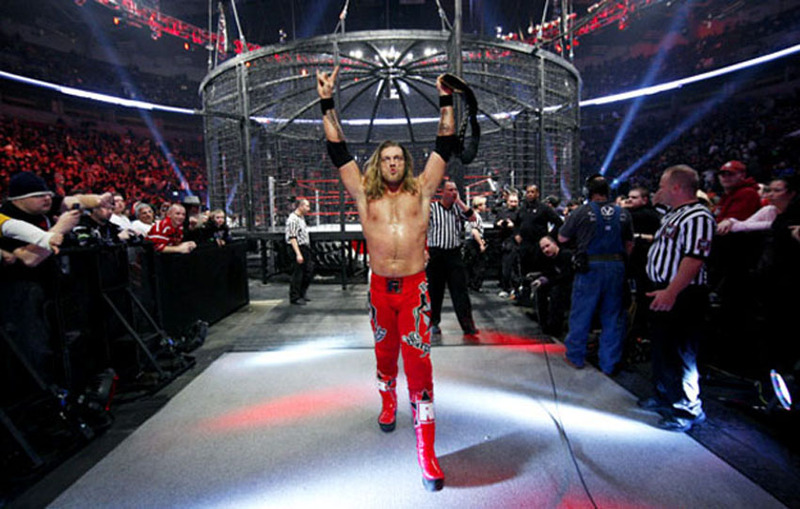 Cena's sad record: the shortest survival of a defending champ in a elimination chamber match in all WWE 's history? JOHN CENA PINNED AFTER ONLY A FEW MINUTES OF FIGHT! The spotlight focuses on the last chamber. Out last is John Cena. Cena hits the ring and takes out Edge. Cena clotheslines Jericho along with a suplex. Cena with a bulldog on Edge. Cena tosses Jericho over the top rope to the steel flooring. Cena with a twisting powerbomb on Edge. Cena calls for the five knuckle shuffle and connects. Cena attempts the Attitude Adjustment when Jericho hits the Codebreaker on Cena. Cena also takes a 619 from Mysterio. Edge with a Spear on Cena, hooks the leg and gets the pinfall. JOHN CENA FALLS VICTIM TO THE RATED-R SUPERSTAR'S SPEAR! EDGE PINNS CENA,ELIMINATING THE WORLD HEAVYWEIGHT CHAMP!